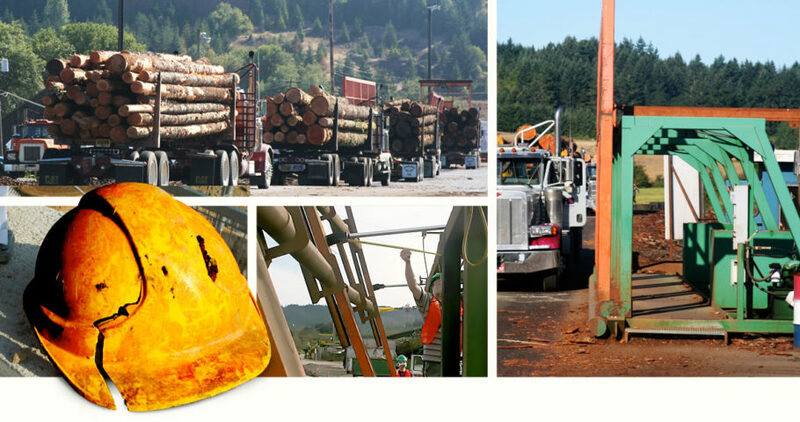 Our client, a log truck driver, was severely injured as the result of a defective “wrapper rack” at an Oregon wood products mill. We had to prove the equipment was defective in order to win compensation for him and his family. A wrapper rack at a logging mill is intended to protect drivers from falling logs during the process of unloading log trucks. The truck is brought along side the rack, which extends out to help hold the logs in place while the driver removes the cables (“wrappers”) that help secure the logs during the drive from the woods to the mill. The rack in this case did not extend evenly, allowing a gap between one end of the rack and the logs. As our driver was unloading, two logs fell on him. The first grazed his helmet, hit his face, shoulder and midsection, and knocked him onto his back. The second log smashed his leg. These serious and painful injuries cost the driver not only the full use of his limbs, but the ability to make a living for the rest of his life. The Oregon Employer Liability Law requires that those who have responsibility for any work involving a risk or danger to workers to use “every device, care and precaution that is practicable to use for the protection and safety of life and limb.” The Oregon Safe Employment Act requires every employer to, among other things, do everything “reasonably necessary to protect the life, safety and health” of employees. The mill here failed to do so. After one of our engineering experts was allowed to test the wrapper machine at the mill, we were able to demonstrate that the rack was defective and did not operate as was required for worker safety. The log truck driver’s case against the mill was settled for a confidential amount before trial. When a company fails to comply with worker safety laws and an employee is injured, the company can sometimes be held responsible for the injured worker’s medical expenses, loss of income, and loss of normal enjoyment of life. If a worker is wrongfully killed, families may sometimes ask the courts to hold the the company responsible for medical expenses, loss of services, and the loss of support and companionship of the loved one. It takes a good knowledge of the facts and applicable law in order to determine when a company can be held accountable for a loss. In many cases, the company is protected from liability by workers compensation laws that prevent workers and their families from using the courts to enforce safety laws. There are exceptions, particularly where a company is an “indirect” employer of a worker, or where a third party is responsible for causing the harm. Logging is one of the most dangerous jobs in the U.S., often involving long hours and hazardous conditions. In 2017, the rate at which loggers were killed was nearly 30 times higher than the national worker fatality rate. According to the U.S. Bureau of Labor Statistics, an average of 66 loggers die on the job each year. Not surprisingly, the majority of these injuries and deaths involve transportation or falling objects. Lawsuits often are the only way to hold companies accountable for failing to keep their workers safe and to obtain justice for injured workers. Lawsuits also can force companies to reexamine safety systems and make changes to prevent future injuries and deaths.